This month we are looking kitchen handles – the various types of handles you can go for, the styles that they work best with and even whether to have them at all! Whether you go for a cup, a knob, a bar, a ‘T’ or indeed, no handle at all – a seemingly small detail can make a big difference in your kitchen. Seen here on our Salcombe range, this handle is called a ‘T’ handle because the cross section is shaped like a capital T. Most commonly used on smaller cupboards where there isn’t a huge amount of weight, such as a wall cupboard, these are quite unusual and very stylish. Combine them with a straight bar handle to create visual interest. A bar handle is a handle that is fixed to the kitchen door at 2 points, usually at each end but can be inset so that the bar section protrudes beyond the fixing. Within this type of handle you can have a ‘D’ shape or a bow that is curved, or straight bar such as this one shown here (again on a Salcombe kitchen). The finish is usually metal but can be shiny chrome, brushed steel or even textured. Depending on style and finish, they can work well in a range of kitchens with a sleek chrome handle looking good in a modern kitchen to something rounded and classic in a traditional one. Knob handles continue to be one of the most popular of all the door handles and there are so many to choose from. A simple round pewter knob such as this shown on our Portland kitchen gives a vintage, understated look while a crystal knob adds glamour to this Oakley kitchen. 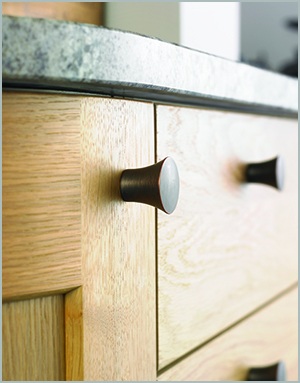 You don’t have to stick with a round shape either; check out the square knob on the Bramham kitchen. Cup handles really work well in a traditional or vintage kitchen. Shiny, chrome ones can add some glamour while brushed steel or pewter ones create a lovely vintage look. The Henley kitchen shows a dark, matt finish which contrasts well with a light, painted door. Cup handles are most frequently used for drawers and are commonly combined with other types of handle for cupboards such as a knob in the same finish. A middle ground between a handle and no handle at all, something like this ‘barely there’ handle shown on the Linea Curve kitchen works as a subtle design feature (creating almost a wave effect) while still giving you the practicality of a handle of some kind. Of course, the most modern and sleek of kitchens wouldn’t be seen dead with a handle breaking up the smooth lines! Removing all handles completely gives a continuous, uninterrupted style and works particularly well with a high gloss finish. Visual interest can be added by combining different door materials, such as this Modena kitchen. The practicality of opening is provided by a range of design solutions such as push openers and moulded doors. There are of course many more types of handle than we can easily include here. Did you know that one of the best ways to choose a handle is to feel it? The handle is the part of the kitchen that you will touch dozens of times a day so you need something that feels comfortable and works best for you, as well as looking at the visual style of it. Therefore, the best way to really get a feel for what’s available is to pay a visit to the Daval showroom in Huddersfield where you can see them and touch them and open as many cupboards as you want with them! For more information or to book a design consultation, call us on 0800 321 3491. 0 Responses to "Kitchen Monthly Trends Blog – December"